Side note: There will be no chat on Saturday, September 22, 2018, because of the Sabbat Celebrations on Friday and then the Esbat on Monday, September 24th, 2018. If anyone wants to use the chatroom to visit with other coven members go right ahead. The chatroom was set up partly for Esbat and Sabbat gatherings and partly for any coven member to use to talk to other members or close friends. All we ask is you do not use to do rituals in without a Coven Life Coven Elder present.m Thank you! Before we celebrate the Autumn Equinox – Mabon in the Northern Hemisphere and the Spring Equinox – Ostara in the Southern Hemisphere we will be doing a special spell/blessings for two of Lady Beltane’s grandsons. The reason for this is their full custody has been given to their father who is a negative person is his wife. Lady Beltane’s daughter has been their spiritual teacher since infancy raising them not only in the Christian beliefs but more in the Lakota Native American tradition. The boys are in need of more protection now that they will be living full time with their father and to let their eyes be open to the type of person he really is compared to the fake Mr. Nice guy he shows in public. LADY BELTANE: I call upon the triple goddess as the Crone and the Horned God to walk this circle with me three times three. To keep those in the circle safe and to not let any harm come to anyone outside our circle. We are now in a place between planes, where time has no meaning. TAke the white taper candle and carve the names Christopher and Cory 2 (make sure to have the 2 after Cory or the protection will go to his father instead) and the word Protection. We call to ArchAngel Micheal to wrap Cory 2 and Christopher in a bubble of white protective light. To guard the young men with his sword and shield. We call to the god Thor to add his power to the bubble of protection and to guard the young men with his hammer. We call to the Mother Goddess Hekate to add her power to the bubble of protection and through her let the young men always feel and trust the love their mother has for them. We call to the Universe to let Cory 2 and Christopher’s eye wide open to see their father and step-mother for people they really are and not the false front they put on for everyone they come into contact with. We ask these things for Cory 2 and Christopher to keep them safe, to let them finish growing into loving, caring, and honest men. Let the candle burn for one hour. Then light it daily to burn for one hour until it has completely burned out. Take the melted wax and place it under a bush or close to a tree. Mother Earth will take the energy in and release it into the Universe so the spell/blessing stays strong for a long time. If anyone wants to leave the circle at this time please type in LEAVING so I can open a doorway for you to pass through. EVERYONE: PLease introduce yourself (FIRST NAME ONLY) and what state or country you live in. EVERYONE: Cut the apple in half horizontally. Place the 2 halves side by side. Place the orange candle in the middle at the top part of the two halves. Notice that the center of the apple looks like a pentagram. Light the orange candle while asking Hekate to enter your home to help bless it. Next starting at the top point of the apple pentagram start by asking Spirit to enter your home and bless it. Remember to touch each point of the pentagram, in turn Next, you will ask Air to enter your home and bless it. Next comes Fire ask it to enter your home and bless it. Next, ask Water to enter your home and bless it. Finally, ask Earth to come into your home to bless it. When you are done calling in the elements wait 2 minutes thinking about your home being blessed with warmth, enough food, and warm clothes to get you through the coming colder months. Then thank the elements and Hekate for their blessing and tell them to return from where they came. Let your candle burn all the way down if it is a small one or if it is larger let it burn for about a half an hour this evening. You can than relight it when you feel the need to. After the circle has been opened take one half of the apple outside to share with the wildlife around your home and allow the other half to dry out and leave it out somewhere in your home to help the blessing continue. LIght the yellow candle and set it about 12 inches away but in front of you. Take 2 minutes to write one goal on your egg that you would like to achieve before Mabon arrives. Try to use only 1 or 2 words to write your goal in any type of alphabet you want to. Runes, Ogham and other types of “magickal alphabets or symbols can be found by either searching on Coven Life website or doing a search on the internet. Type in “DONE” when you are through. Now carefully holding the yellow candle allow wax from it to drip on to the egg, turn the egg so the wax gets all over it while asking Ostara to help you reach your goal. Take 2 minutes to do this step. Type in the word “DONE” when you are through. After the circle is opened take the egg outside and bury it while asking Mother Earth to help your goal to grow and be harvested on Mabon. Then work towards your goal daily until you reach it. Let the candle burn all the way down and bury the melted wax with the egg so it keeps feeding the egg energy. EVERYONE NORTH and SOUTH: Lift your glass of juice/wine in a toast to all the gods, goddesses, the Archangel, and elements that helped us with all or rituals this evening. Repeat Lady Beltane’s toast. Remember to save a little to pour on the ground as an offering to the gods and goddesses that helped us tonight. LADY BELTANE TOAST: We raise our glasses in to honor Hekate, Thor, The Horned God, Ostara, The Crone, Moter Earth, Spirit, Air, Fire, Water, and Earth for their power and help with protecting Lady Beltane’s grandsons, blessing our homes or helping us reach our goal. EVERYONE: Type in “So mote it be” when you are done saying the toast. 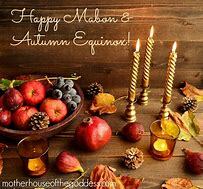 Posted on September 19, 2018 September 21, 2018 by Lady BeltanePosted in Fall Equinox/Mabon, Rituals, Sabbats, Southern Hemisphere Sabbats, Spring Equinox/OstaraTagged Autumn Equinox, Mabon GAthering, Online Coven Gathering, Ostara GAthering, Pagan, Solitary Witch, Spring Equinox, Wicca, Witchcraft.